Quality Preparation. Detail Review. Just Done Right. Our experts understand the importance of accurate tax filings to the IRS and are committed to delivering the best customer experience. We are committed to timely, accurate and maximized tax filings for individuals and small businesses. Schedule the preparation of your individual or business tax return, in office, with your community tax pros. Our tax services include the convenience of mobile pick-up at your home or office, by appointment only. A full small business tax service virtual appointment includes the options of E-filing , Rapid Refund and Direct Deposit. Zero Out of Pocket Fees. We provide monthly bookkeeping services available for entrepreneurs, small to mid-size businesses with unique to business package options. The third month of service is half-off. Contact us, today for your no obligation consultation. Why do you issue 1099 forms? "You are required to send Form 1099 to vendors or sub-contractors during the normal course of business you paid more than $600, and that includes any individual, partnership, Limited Liability Company (LLC), Limited Partnership (LP), or Estate. A vendor or sub-contractor, essentially a person or company you have paid for services isn't your employee." 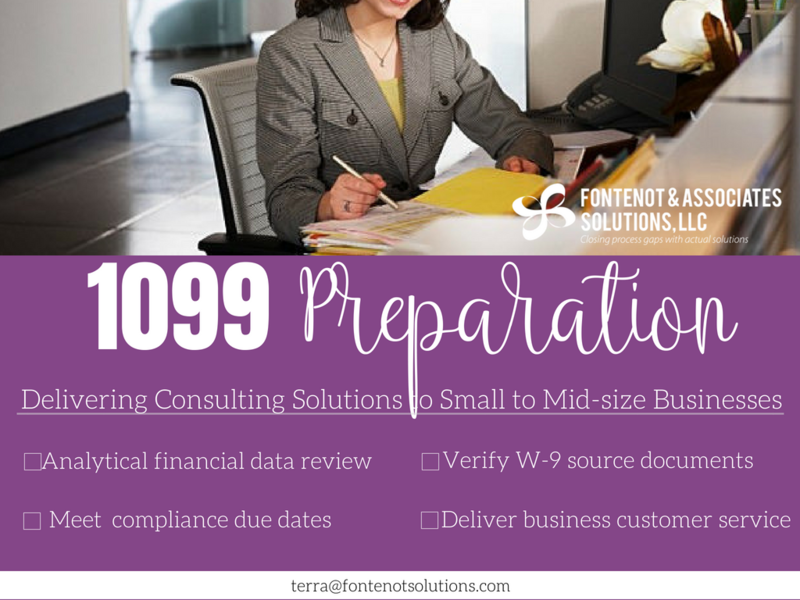 Are you preparing yourself for the 1099 form filings now? Our community strives to keep you informed and updated. Join our mailing​​ list to learn more about IRS changes, company specials and referral program updates. "Our team of innovative professionals use their knowledge and experience to set your business and team of professionals up for success. Our extensive accounting and operations skills are a start and key tools to company growth, building team cohesiveness, establishing clear purpose and goals, and improving process inefficiencies. Our services are key to businesses of all sizes. We handle providing the detail framework to your business so that you may focus on building your business. We also additional services and support with monthly operational and accounting task, reconciliation and training."